Thank you so much for all the comments on my crazy starburst quilt! I’m so pleased to hear that you all like it too. I’ve decided that I like it so much that I already have a second in the works. 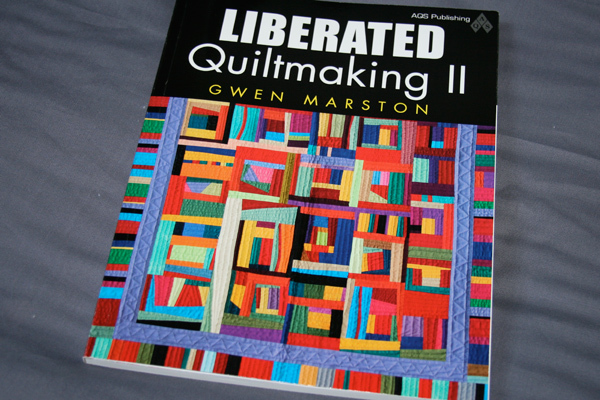 A couple people mentioned Gwen Marston’s Liberated Quiltmaking II book. 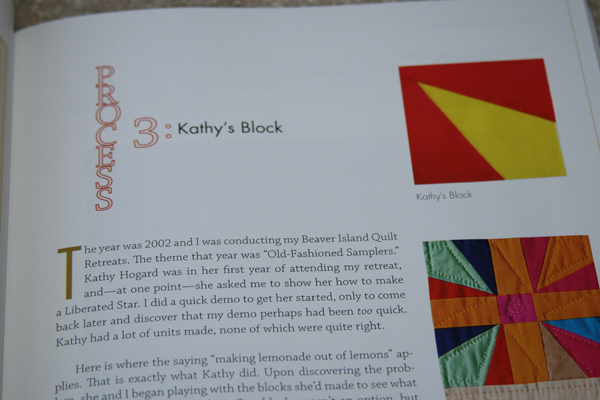 Even though I own this book, I’m a little embarrassed to say that I had no idea that Gwen had included a similar quilt in her book. Last night I got the book out so I could take a look, and sure enough, she has a very similar quilt out of solids on page 47. What strikes me as interesting is the idea that nothing in quilting is really ever completely new, but rather we build on, expand, or discover for ourselves something that may have already been done. When I first started sewing and buying fabrics, a local shopowner kept telling me that same thing – I’d come in excited about a new block or a new piece of fabric and she’d always say “it’s not new, it’s just coming back around again”. 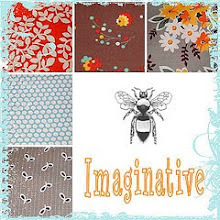 Initially I wasn’t sure I believed her, but now that I’ve been sewing for a little longer, I realize that there’s some truth to that (take a look at this Flickr group for new fabrics that have been recreated from old designs). With this quilt, I feel like I discovered for myself a very similar pattern that Gwen had already discovered. What’s interesting though is that we came to a similar design, but we were initially inspired by different blocks. As Gwen discusses in her book, the blocks she uses to make up the square are based on a student’s error while making liberated star blocks. The resulting shape, when sewn together, creates this fun block. Then when sewn together with other blocks, it also creates a secondary pattern. I put together each half of the square separately, cut each down to size (my blocks are 10″ square), and then sewed the two halves together. Since I did it this way (and since I varied the widths of my wedges) I don’t have that secondary pattern when I put the blocks together. As I learned last night while reading Liberated Quiltmaking II, Gwen sews quarter squares with three fabrics per quarter, and then sews the four together into a square block. 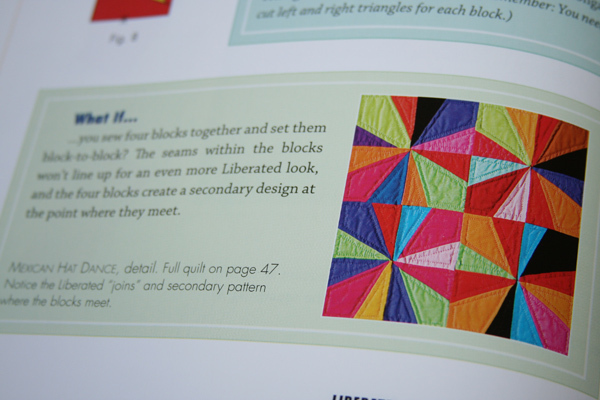 If you’re looking to make this type of block, you might want to take a look at Gwen’s method in Liberated Quiltmaking II . She also provides great examples of other types of patterns you can make using this quilt block. Since my method is a bit different, I’ve put together a quick tutorial for you showing how I constructed these blocks. It’ll be up in the next post! This entry was posted in Posts about Quilts. Bookmark the permalink. crazy crazy, or crazy fun? I believe that all the ideas are already “out there”. We just have to open our minds to find them. (Look again the Gees Bend quilts!) Nice to see you are expanding your horizons. Love your blog! It’s true Angie – I’m always inspired by the Gees Bend quilts! But still — it’s beautiful! Histories and personal preferences add to each new version. Sometimes there is parallel discovery. The adaptations are what make some versions reproductions while others are works of art. As always, the attributions are appreciated. The stories behind each new work are certainly welcome inspiration. I totally agree with that line of thinking…we tend to recreate or rediscover. Either way, I am loving your crazy fun!! I really enjoyed this post! It’s quite interesting to hear your thought process behind the idea and then how it relates with other work out there. Thanks! Great post, I definitely agree! Sometimes I feel like I’m reinventing the wheel. Ugh. such whiners out there! 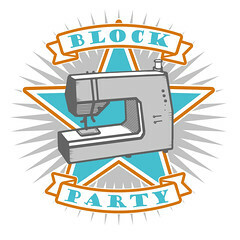 Your block IS original because of the method and true “liberation quilting” and is not like the books traditionally structured 4-square block. The design is a basic geometric design we all have seen since kindergarten so naturally we are going to bring it into line with our fabric creativity. I love reducing steps and you have done that. Plus, you took the time to SHOW us how to do, not write a book and try to make money from a pattern anyone can figure out just by looking at at quilt. What was NOT figured out was YOUR PROCESS, which IS new to most of us. Most were fooled and thought yours was a four-square and not giving credit where due; I appreciate you did not cower and stood up and explained the PROCESS. It is different and less structured. It has inspired me to think out of the box, liberate my mind from typical assembly of blocks and see where I can convert four-square blocks to half-squares — And I will share them AND give you credit for the pushing for elimation of steps! THANK YOU! !